I have been using two partial backup solutions: IBM's Tivoli Continuous Data Protection and CrashPlan. They are somewhat different. I use Tivoli on selected directories to 1) backup to a second internal drive and 2) replicate that backup to an encrypted external drive that I keep in my car. I use CrashPlan to backup those same selected directories across the Internet to an external drive at my mother's. Tivoli is a commercial product, $54 for a permanent license. I use the part of CrashPlan that is free. Tivoli and CrashPlan both maintain versions of files in their backups. But I got to worrying that I still had a lot of low value data that was not backed up anywhere. My drives are internal 400GB and 1TB drives and a 2TB Drobo (first generation, USB 2.0 attached). So I bought a 5TB external drive to backup everything. My son-in-law is using Carbonite. When he had an internal drive fail recently he did a Carbonite recovery over the Internet. It took several weeks and generated several calls from Comcast about bandwidth usage. Subsequently he is using PureSync (free for personal use) to synchronize his Drobo with his internal drive. This doesn't address the Internet recovery situation. But I wanted something to create pretty much an image of my drives so I could not only restore specific files but restore an entire drive if I had a drive failure. And I didn't want it to go over the Internet, not just for security but for bandwidth and recovery time. Here's a bunch of sources that I looked at along the way. For the moment I'm testing Drive Snapshot. It is a commercial product (€39) with a 30-day trial. Unlike PureSync it doesn't require an install on the source system so I loaded the executable on the 5TB external drive. It takes compressed image backups. 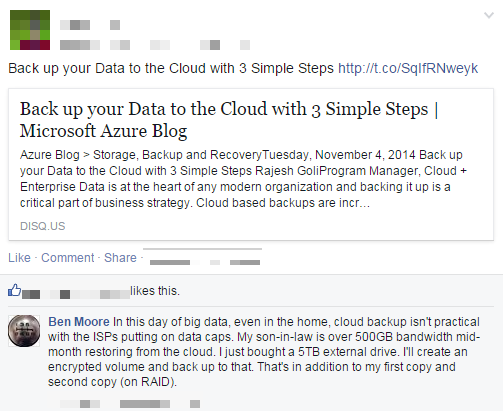 It takes differentials rather than incremental backups. It also has the ability to mount the backup file as a virtual drive which you can then access using Windows Explorer. It will do its own encryption but I'm a big fan of TrueCrypt so I'm just backing up to an encrypted volume. I told Drive Snapshot to back up all of my volumes including the Drobo. It has to run as an administrator. It uses Windows Volume Snapshot Service to let you continue to operate while it's running. The times are in minutes. The Drobo took almost a day each for backup and verify. I believe that this is amplified greatly by the USB 2.0 interface. The Data drive and the Drobo are heavily JPEG and MPEG so they don't compress very well. This is the Drive Snapshot log. The full backups of all my data used about 1/2 of the 5TB drive. My plan is to take monthly differential backups. I should be able to take several of them before I will need to do another full backup. The direct impact on the system was minimal. I saw Drive Snapshot up around 500MB of RAM and nominal CPU. Most of the time it was using less resources than CrashPlan. However during the backup the system was very sluggish. Physical Memory hovered just below 100% of 8GB. It never wouldn't respond but was just really slow. This wasn't a problem for me as no one actually sits in front of that system. It cleared up after the backups completed. I think this memory usage was caused by the VSSs. After a month I had Drive Snapshot run a differential backup. Generally the backup times are consistent with the initial backup. However the verify times are greatly reduced in line with the amount of changed data. Similarly the smaller compressed sizes are representative of amount of changed data. As expected the big change was on the Drobo. I had cleaned up a lot of data on it but added a lot of new data. The differential backups used about 500GB. Looks like I can keep a couple of months of differential backups at a time and only do a full backup annually or semi-annually. I think Drive Snapshot is a keeper. I've discussed Internet bandwidth before. Here I go again. I've got to lay a little groundwork. My son-in-law uses Carbonite for backup. It's rock solid and they like the ability to view their photos using the Carbonite iPhone app. I've been using CrashPlan with my own offsite storage. Then mid-December 2014 CrashPlan offered a promotional price on their online backup service and I picked that up. 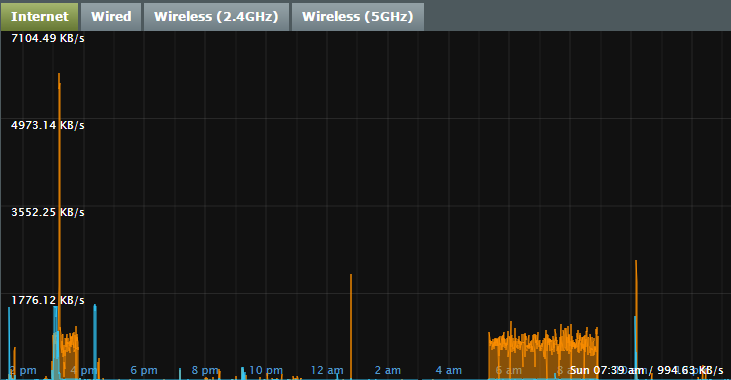 Here's what it did to my bandwidth. That sudden drop on Christmas Eve wasn't a Christmas present. That's when I realized I was going to blow by the Comcast 300GB bandwidth cap. I managed it pretty well coming in at 297GB for the month of December. I turned CrashPlan's bandwidth usage back up in January. So that's one side of the issue. The other side is restoring over the Internet. My son-in-law had a hard drive crash and initiated a restore using Carbonite. Here's what his bandwidth usage did. That's what 1.5TB of Comcast bandwidth looks like. And yes he got a call from Comcast. And it took more than a month to complete the restore. Incidentally it looks like Carbonite is resending the restored data back to their servers effectively doubling the bandwidth usage. And recently my granddaughter spent the night with us. She's addicted to a children's show carried by Netflix. Can you guess what time she woke up? Almost 10GB in under 4 hours! That's a day's worth of my Comcast cap. Again a non-trivial upload bandwidth, almost 20%. Odd. 3. I can already see Comcast's bandwidth cap of 300GB looming in my future. Here's a post by one of my Facebook friends and my response. I'll follow-up on my backup alternative in a later post.